Use of automatic tote-dispensing systems at Feintool North America and Batesville Tool & Die ensures that presses don’t stop as the press lines fill relatively low-volume packages of stampings, as required to fit assembly-line operations at their customers’ plants. At left, Feintool employs a Tote Goat automatic tote-dispensing system, which loads empty totes from the top down onto a conveyor. 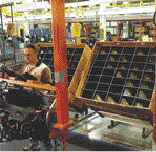 Above, Batesville employs inhouse-designed-and-built tote-changing conveyor lines to keep its presses running. Eliminate 11 wood pallets from your supply chain and you save one tree. Remove 20 lb. of solid waste from your supply chain and save 1 gal. of gas. Remove 5 lb. of solid waste from your supply chain and save 9 gal. of water. These three factoids, lifted from the website of reusable-packaging-equipment provider Orbis Corp., Oconomowoc, WI, represent what’s becoming a manufacturing mantra: “Green” manufacturing is good for the environment, and it surely can be good for both ends of the supply chain, supplier and customer alike. Reusable packaging, as an alternative to wooden pallets or corrugated-cardboard boxes, reduces waste and the non-value-added labor for setup and breakdown of the boxes; improves warehouse-space utilization as well as worker safety since ergonomically designed containers can ease handling; and can improve product flow in terms of safe and efficient transfer of parts and subassemblies to the customer. All of these benefits point to reusable packaging as a catalyst for implementing a lean-manufacturing system. “Frequent parts deliveries, standardized package sizes and efficient packaging processes improve the flow of product and reduce the need for extra storage of warehouse space,” is how Orbis puts it. And Jody Fledderman, president of Batesville Tool & Die, Batesville, IN, concurs, noting that nearly all of his customers (primarily automotive OEMs and Tier One companies) now require returnable packaging. protect delicate parts and assemblies from damage during shipping, as illustrated by this Orbis-designed and built white-plastic corrugated container that includes a foam interior to protect headlight assemblies. Manufacturers of packaging products and systems have developed a slew of new offerings in recent years, and Hardt offers that perhaps the biggest challenge a metalformer faces in moving to returnable packaging is simply keeping up with what’s new, evaluating the options and selecting the best products for the task at hand. Suppliers, for example, have developed bulk containers that collapse when empty to save money on return freight and storage. There also are reusable plastic containers designed to expand in any of three dimensions—height, width and length, to adjust to changing packaging requirements. Automatic tote-changing machines not only dispense totes of various sizes and speeds, but also include automatic part counters, level sensors and weight scales. Hardt has several press lines at his facilities that employ automated packaging systems. 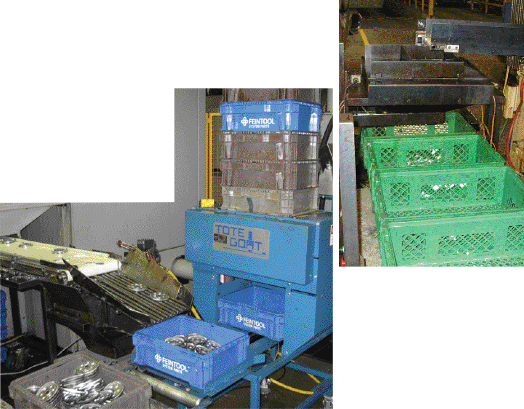 Parts come off of the press and onto a conveyor that deposits them into returnable totes or containers. The packages are automatically weight-counted and, when full, move down the line and a new empty container is placed on the line. This minimizes labor and improves the accuracy of part counts to the customer. Feintool engineers design the automated packaging systems themselves, and then work with suppliers to adapt their equipment to fit Feintool’s processes, including matching packaging equipment to conveyor sizes. Use oflow-part-count, reusable, custom packaging along automotive assembly lines, as shown here, supports lean manufacturing initiatives and optimizes use of floor space—on the line as well as in the warehouse. At Batesville Tool & Die, six of its 40 press lines include automated packaging systems, and several other lines employ operators to manually custom-load smaller reusable containers. Also, says Fledderman, there are instances where he cannot avoid repacking for customers—running into larger containers (maybe cardboard boxes) at the press and then repacking into smaller containers for shipping, an expensive process that also creates opportunities for mistakes. Batesville’s automated packaging lines are designed and built inhouse. Conveyors loaded with plastic totes automatically index after so many press strokes. The firm designed the automated tote-changing lines to be easily moved from one press to another as needed, and they are adjustable to work with a variety of tote sizes. 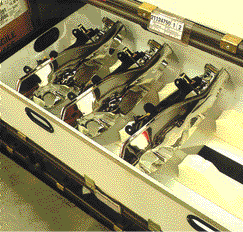 For those stampings where the customer requires parts stacked or oriented in a specific in the package (perhaps to prevent damage to the part or fit more parts into the package and minimize air space), the firm relies on operators stationed at the end of presses to carefully load containers. I agree on the fact that Eliminating 11 wood pallets from your supply chain and you save one tree.Reusable packaging is something every SCM company is really opting to these days. And I must say this is a great contribution in Go Green initiative.